This is not your daddy’s bass fishin’. And it wasn’t mine either, until not all that long ago. Since my childhood, largemouth bass fishing meant farm ponds and spinning rods terminated with purple worms, Original Rapalas, and jitterbugs. Good bass were fat, chunky pigs, lazier as they got bigger, not unlike we fishermen, and a good bassin' day was spent casting from the bank, preferably with a cooler beside you, and filling a stringer. 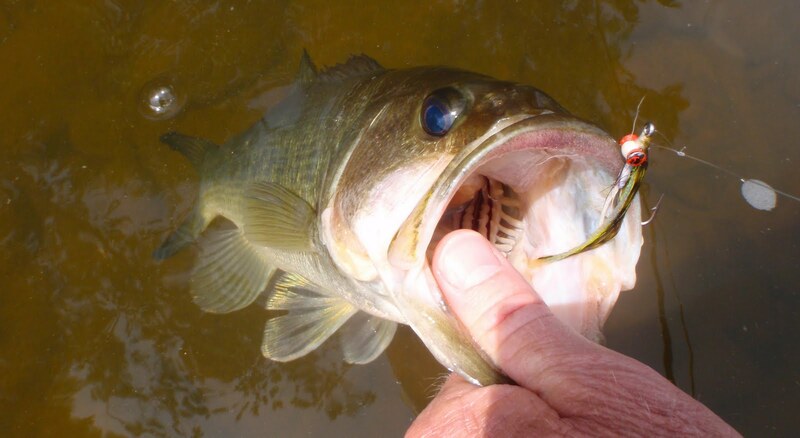 Today’s incarnation of accepted bassing is fast boats, rods that would yank a tuna from the Mariana Trench, jerk/crank/swim/buzz baits designed by computer, and hard-charging, aggressive fishing. Tournament style. I never got that far, though I probably would have liked to. But that was before. Before fly-fishing and before river bass. I first picked up a fly rod with trout firmly in mind. While hiking in the North Carolina mountains, I fell in love with the clear, tumbling streams and the notion of chasing the beautiful fish that inhabited them. But, living in the Piedmont, access to cold-water streams was problematic and I turned to what was close and familiar – bass water. Sadly, I quickly found fly-fishing on ponds unsatisfying as I had become infatuated with running water. And then we moved to PBO. I now have a splendid waterway just a short hop from my front doorstep and there I have found the best of all worlds. My favorite stretch of river could have been lifted straight from the Appalachians and it’s filled with river largemouths. It’s mountain trout pretty and river bass tough. And river bass are tough. 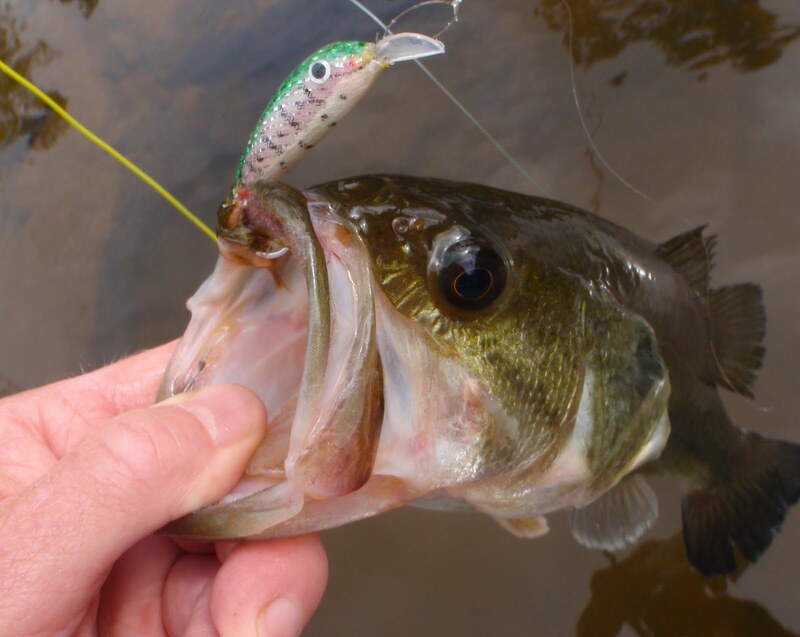 No chubby football-shaped bass on the shoals. 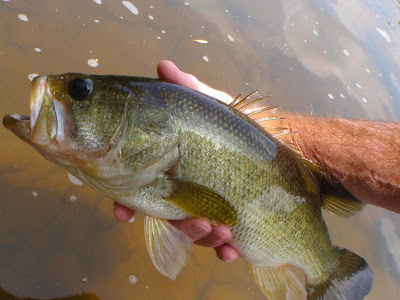 Lean, mean, and strong - I assume from constantly fighting river currents - a sixteen inch river bass weighs less, but packs more punch than his equivalently sized stillwater dwelling cousin. More simply stated, shoals bass kick pond bass’s asses. 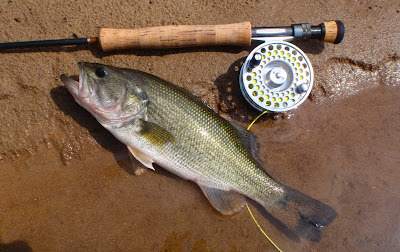 Add a fly rod into the mix and you have some serious fishing fun. I'll bet a few guys have caught a nice fish, bass or trout, on fly fishing tackle, but I don't actually know anyone that has. It seems like a little fish method to me. My observation is that fly fishermen are all show and no go. It seems to be all about "fishing" not "catching". And that was from the forum moderator. So I seek solace with those “little fish” people, my fly-fishing buddies. But there’s a bias there too, for coldwater species in general, trout in particular. My local compadres are more accepting, living in warmwater country, but I know trout are always in the back of their minds. I guess I can’t blame them. So I’m an outsider, of a sort, caught between worlds, chasing the everyman’s fish, in an odd place, with esoteric tackle. I’m stuck in the middle and, frankly, am very happy to be there. And the bass forum moderator was right. It is about the fishing, not the catching. I think my daddy would have understood and appreciated that, even though it isn't his kind of bass fishin'. Note: The pictures in this post were taken yesterday during a pleasant morning wade. Perhaps you can see why I’m smitten. I envy you because you do have the best of both worlds. In Alabama we are lucky to have a stream like you fish. Sure there are creeks with bass and gills in them, but to have the trout to boot is a luxury. I have had great success with the hopper in streams and on lakes down in this part of the country. Enjoyed the Post. Your article is unique. I would like to share this to my Facebook. I like it. Your writing skill is impressive. Your fish is big one. Your are lucky enough. Thanks a lot for sharing. Mike, very nice photos. And that large mouth fish is a big one. I like the water color of that lake as well. Just wondering what have you done with that big fish in the end?